We are continually looking to improve support given to trainee doctors throughout their postgraduate education. 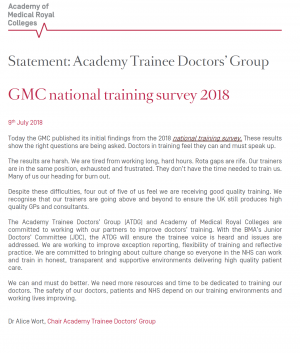 The Academy Trainees Doctors’ Group, comprised of junior doctors from across the colleges and faculties, takes the lead in this work by identifying issues that affect all the trainee doctors and could be improved across the whole NHS. The work is led by Dr Alice Wort (Chair) and managed by Claire Comber. For further information on any of our past or current work with trainee doctors please contact Claire Coomber.